Sorry for not been posting updates lately... Its the HOLIDAYS man .. needed some therapy ... BAKING!! ... Recently did a few bakes which I am really very happy with. 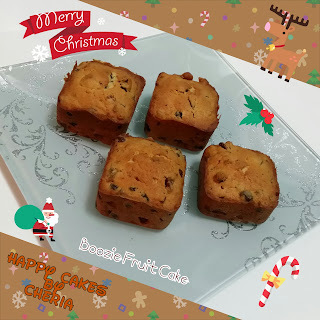 Had done some Boozie Fruit Cakes as gifts (definately for Adults only) ... Did two version actually .. coz I had 1kg worth of fruits to use .. Used the whole bottle of Myer Rum for this .. Very BOOZIE indeed .. 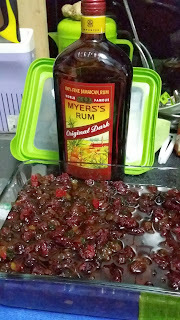 I was worried too boozie so I didnt add additional Rum during baking. However, as per my office colleagues who tried this batch, they commented its too much .. er .. but who will hiam too much booze?!?! Anyway, my colleagues dont really keen on this cake. So i decided not to bake any more of this cake for them .. HAHAHA ... only a few who knows to appreciate bah..